Hello! 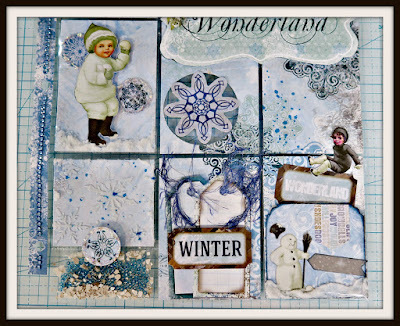 It's Marci here today with a Winter/Snow Mixed Media Pocketletter. I was happy to be chosen as January's Guest Designer for (click & go)-> FotoBella. I will , naturally, be swapping this with a fellow swapper; this happens to be my 36th Pocketletter, so you can see I am hooked! I used a sheet from the BoBunny Winter Play Collection as the background card in each pocket. I used many other pieces from the same collection throughout this Pocketletter; for example, even border punching a strip for the side bar and then using Blue Rhinestones on top. I coated many of the snowflakes on the paper with Stickles to make the sparkle. I also used the ephemera pack from BoBunny called Whiteout Noteworthy throughout, for example I attached 2 "tickets" Family & Fun and then attached the stamped Julie Nutting snowman to those tickets. On the outside of the Pocketletter I fussy cut WINTER WONDERLAND, popped it with Foam Tape. Then I attached G45 French Blue Rose Collection, tipping the leaves with texture paste to emulate snow. I also include a shaker aspect in my Pocketletters. In that pocket I have added Mica flakes, Micro Beads and Glass Beads. I made the shaker using 1/2 of one pocket using The We R Memory Keepers Fuse tool. On 4 of the pockets you will notice a sporadic "spritz" using Tim Holtz Distress Spray.